Storage Gaga – Page 23 – Going Ga-ga over storage networking technologies …. The other day, a prospect was requesting quotations after quotations from a friend of mine to make so-called “apple-to-apple” comparison with another storage vendor. But it was difficult to have that sort of comparisons because one guy would propose SAS, and the other SATA and so on. I was roped in by my friend to help. So in the end I asked this prospect, which 3 of these criteria matters to him most – Performance, Capacity or Reliability. He gave me an answer and the reliability criteria was leading his requirement. Then he asked me if I could help determine in a “quick-and-dirty manner” by using MTBF (Mean Time Between Failure) of the disks to convince his finance about the question of reliability. Well, most HDD vendors published their MTBF as a measuring stick to determine the reliability of their manufactured disks. MTBF is by no means accurate but it is useful to define HDD reliability in a crude manner. If you have seen the components that goes into a HDD, you would be amazed that the HDD components go through a tremendously stressed environment. The Read/Write head operating at a flight height (head gap) between the platters thinner than a human hair and the servo-controlled technology maintains the constant, never-lagging 7200/10,000/15,000 RPM days-after-days, months-after-months, years-after-years. And it yet, we seem to take the HDD for granted, rarely thinking how much technology goes into it on a nanoscale. That’s technology at its best – bringing something so complex to make it so simple for all of us. I found that the Seagate Constellation.2 Enterprise-class 3TB 7200 RPM disk MTBF is 1.2 million hours while the Seagate Cheetah 600GB 10,000 RPM disk MTBF is 1.5 million hours. So, the Cheetah is about 30% more reliable than the Constellation.2, right? Wrong! There are other factors involved. In order to achieve 3TB usable, a RAID 1 (average write performance, very good read performance) would require 2 units of 3TB 7200 RPM disks. On the other hand, using a 10, 000 RPM disks, with the largest shipping capacity of 600GB, you would need 10 units of such HDDs. RAID-DP (this is NetApp by the way) would give average write performance (better than RAID 1 in some cases) and very good read performance (for sequential access). 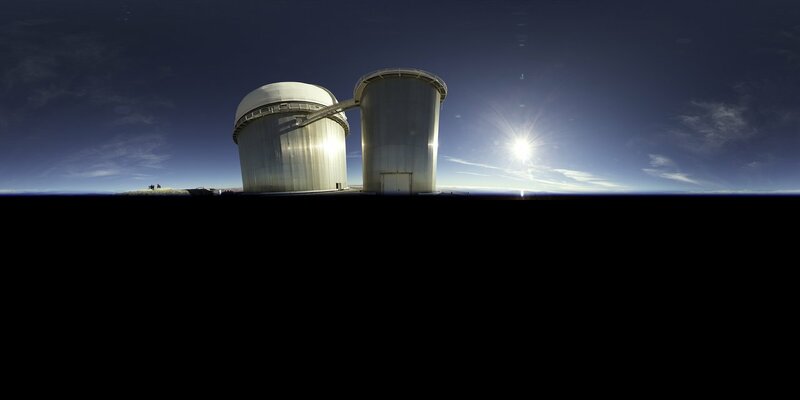 the prospect will be able to determine which of the 2 HDD types above could be more reliable. In case #1, RF is 600,000 hours and in case #2, the RF is 125,000 hours. Suddenly you can see that the Constellation.2 HDDs which has a lower MTBF has a higher RF compared to the Cheetah HDDs. Quick and simple, isn’t it? Note that I did not use the SAS versus SATA technology into the mixture because they don’t matter. SAS and SATA are merely data channels that drives data in and out of the spinning HDDs. So, folks, don’t be fooled that a SAS drive is more reliable than a SATA drive. Sometimes, they are just the same old spinning HDDs. In fact, the mentioned Seagate Constellation.2 HDD (3TB, 7200 RPM) has both SAS and SATA interface. Of course, this is just one factor in the whole Reliability universe. Other factors such as RAID-level, checksum, CRC, single or dual-controller also determines the reliability of the entire storage array. In conclusion, we all know that the MTBF alone does not determine the reliability of the solution the prospect is about to purchase. But this is one way you can use to help the finance people to get the idea of reliability. Attendee: Is the RHEV running on SAN or NAS? ECS Engineer: Oh, for this demo, it is running NFS but in production, you should run iSCSI or Fibre Channel. NFS is only for labs only, not good for production. NAS has always played a smaller brother to SAN but usually for the wrong reasons. 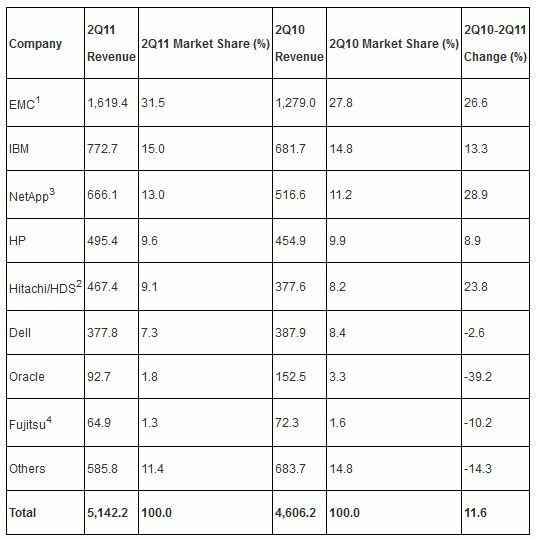 Perhaps it is the perception that NAS is low-end and not good enough for high-end production systems. 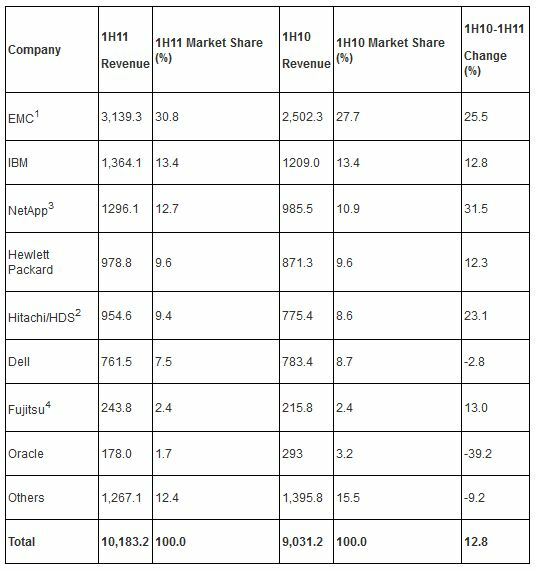 However, this is very wrong because NAS has been growing at a faster rate than Fibre Channel, and at the same time Fibre Channel growth has been tapering and possibly on the wane. And I have always said that NAS is a better suited protocol when it comes to unstructured data and files because the NAS protocol is the new storage networking currency of Internet storage and the Cloud (this could change very soon with the REST protocol, but that’s another story). Where else can you find a protocol where sharing is key. iSCSI, even though it has been growing at a faster pace in production storage, cannot be shared easily because it is block-based. Now back to NFS. NFS version 3 has been around for more than 15 years and has taken its share of bad raps. I agree that this protocol is still very much in the landscape of most NFS installations. But NFS version 4 is changing all that taking on the better parts of the CIFS protocol, notably the equivalent of opportunistic locking or oplocks. In addition to that it has greatly enhanced its security, incorporating Kerberos-type of authentication. As for performance, NFS v4 added in a compounded in a COMPOUND operations for aggregating operations into a single request. Today, most virtualization solutions from VMware and RedHat works with NFS natively. Note that the Windows CIFS protocol is not supported, only NFS. 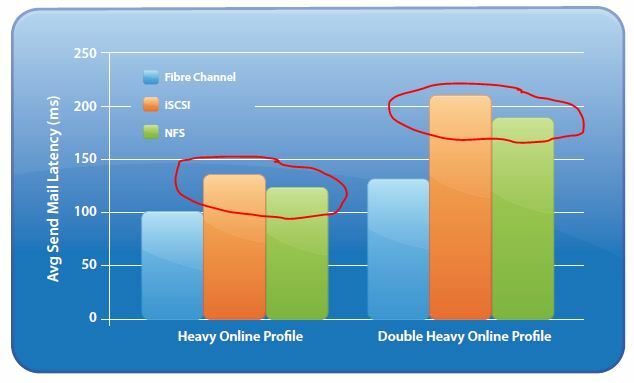 This blog entry is not stating that NFS is better than iSCSI or FC but to give NFS credit where credit is due. NFS is not inferior to these block-based protocols. In fact, there are situations where NFS is better, like for instance, expanding the NFS-based datastore on the fly in a VMware implementation. I will use several performance related examples since performance is often used as a yardstick when these protocols are compared. 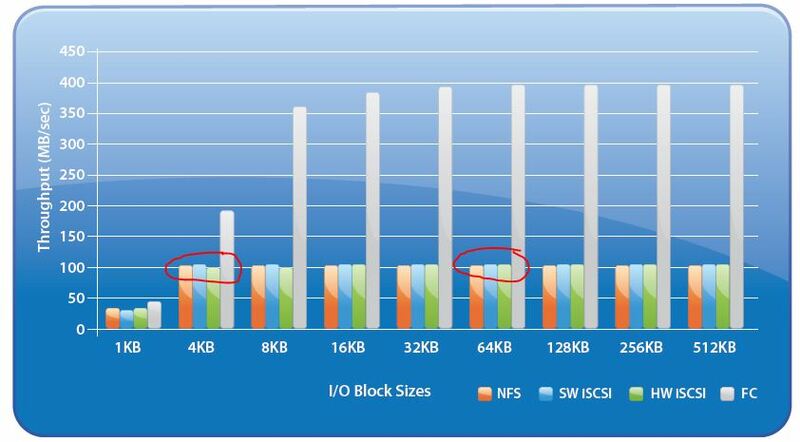 Even though NFS suffers in write throughput in the smaller blocks less than 16KB, NFS performance write throughput improves over iSCSI when between 16K and 32K range and is equal when it is in 64K, 128K and 512K block tests. The 2 graphs above are of a single VM. But in most real production environment, a single ESX host will run multiple VMs and here is the throughput graph for multiple VMs. 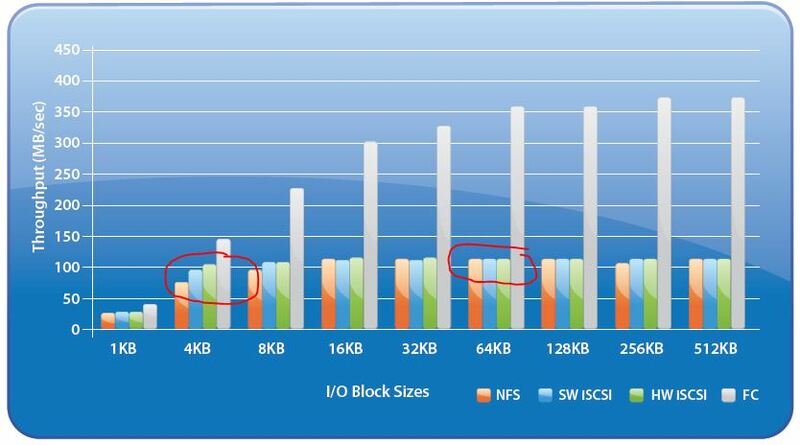 Again, you can see that in a multiple VMs environment, NFS and iSCSI are equal in throughput, dispelling the notion that NFS is not as good in performance as iSCSI. Oh, you might say that this is just VMs without any OSes or any applications running in these VMs. Next, I want to share with you another performance testing conducted by VMware for an Microsoft Exchange environment. The next statistics are produced from an Exchange Load Generator (popularly known as LoadGen) to simulate the load of 16,000 Exchange users running in 8 VMs. With all things being equal again, you will be surprised after you see these graphs. Again, you can see that the NFS’s latency is lower than iSCSI. Interesting isn’t it? 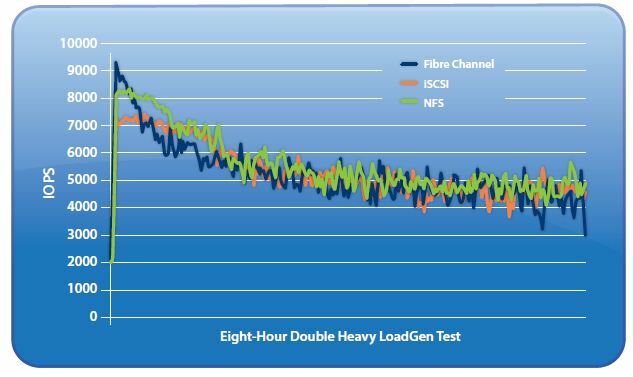 In the graph above (higher is better), NFS performed reasonably well compared to the other 2 block-based protocols, and even outperforming iSCSI in this 8-hour load testing. Surprising huh? As I have shown, NFS is not inferior compared to the block-based protocols such as iSCSI. In fact, VMware in version 4.1 has improved all 3 storage protocols significantly as mentioned in the VMware paper. The following are quoted in the paper for NFS and iSCSI. Using storage microbenchmarks, we observe that vSphere 4.1 NFS shows improvements in the range of 12–40% for Reads,and improvements in the range of 32–124% for Writes, over 10GbE. 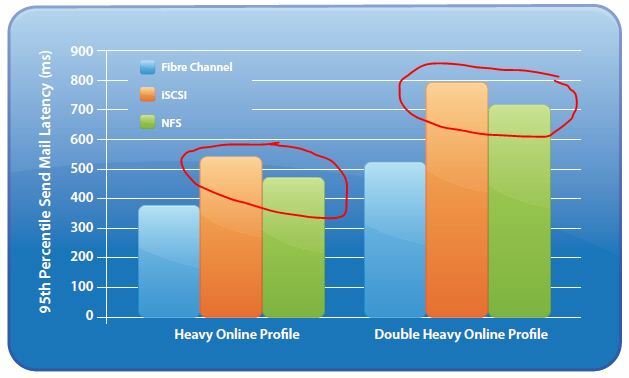 The performance improvement for NFS is significant when the network infrastructure was 10GbE. 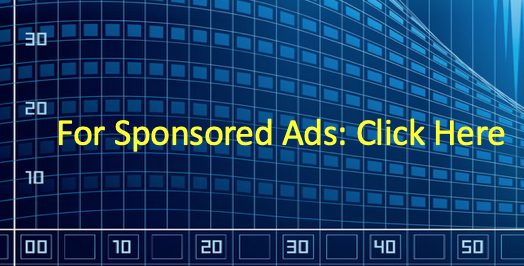 The percentage jump between 32-124%! That’s a whopping figure compared to iSCSI which ranged from 8-19%. Since both protocols are neck-to-neck in version 4.0, NFS seems to be taking a bigger lead in version 4.1. 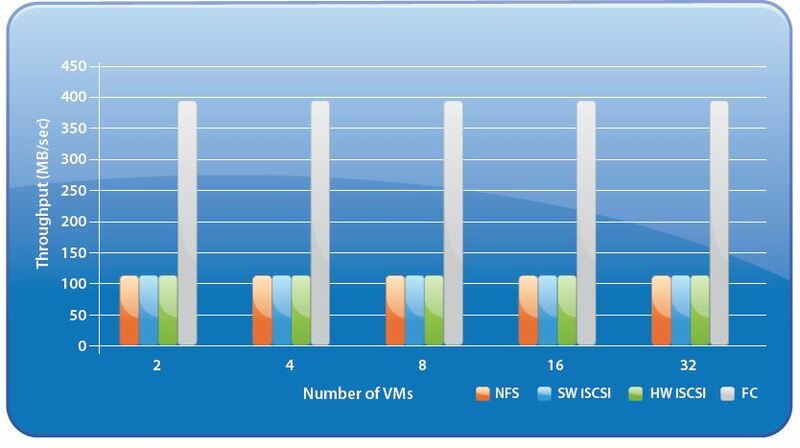 With the release of VMware version 5.0 a few weeks ago, we shall know the performance of both NFS and iSCSI soon. Also note that the load testing are based on NFS version 3. If version 4 was used, I am sure the performance statistics above will take a whole new plateau. 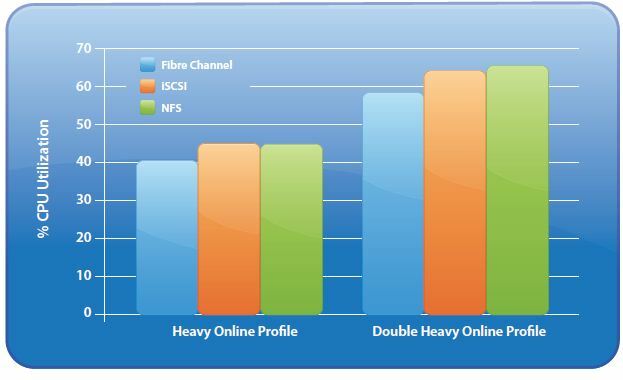 Therefore, NFS isn’t inferior at all compared to iSCSI, even in a 10GbE environment. We just got to know the facts instead of brushing off NFS.